News about Horsted Keynes and this web site. Please don't moan if your news or event isn't mentioned. If you don't tell us then we can't tell everyone else! Are you interested in all things ‘garden’? Village virtually cut off from Haywards Heath! 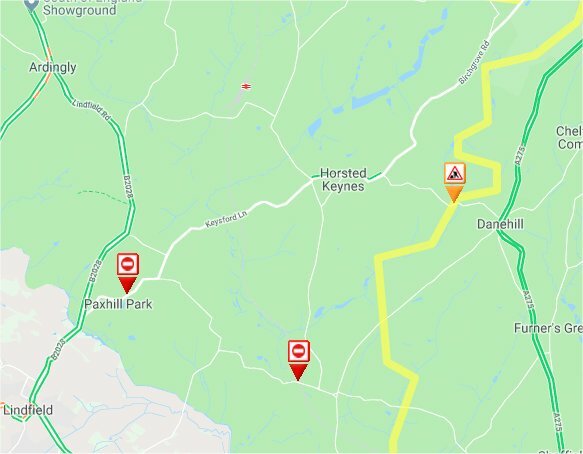 The WSCC map shows the problem of two closed roads. Exactly one year since the previous time when the new water main burst the road to Haywards Heath has been closed in exactly the same place by exactly the same thing. The new high pressure mains have burst yet again - that will be the FOURTH time they have failed! Unfortunately this time Monteswood Lane is also being closed so the village is virtually cut off from it's main shopping and travelling centre. When your webmaster contacted South East Water, who are responsible for the mess, he eventually received the comment that the road needs to "settle" before it can be reopened. Last time the bus was able to travel via Monteswood Lane but this was due to close on 1st October for 15 days to clear up the mess caused by the hot summer breaking the road surface. Unfortunately it seems the road has been closed early - 24 September 2018. At the time of writing it is not known if the bus service to Haywards Heath will be able to run as the only way round now is under "Gerald's Bridge" the smallest in Sussex and used in the famous 1970's AA road advert. This is too small to let a single deck bus pass. Local children were hoping for a few extra days holiday, while local workers are having to re plan their way to get to and from the station. What a mess. "Gerald's Bridge" Remember the advert? WSCC did a splendid job removing two damaged road signs at the bottom end of Sugar Lane this morning, it only taking them an hour to arrive. Because of an "accident" (yet another driver going too fast to negotiate cross roads after closing time) both the Give Way and the road name signs were extensively damaged. No sign of the offending vehicle of course! Let's hope that WSCC are as quick to replace the Give Way sign as the road markings are very worn there so drivers get little advance warning of the hazard at present. Why is the Main Road to Haywards Heath still closed? You see before you Keysford Lane, the main bus and car route between Horsted Keynes and Haywards Heath. Last Saturday South East Water repaired a leak which you can just about see on the road surface - yet another and the second just this year. They then closed the road with a few signs and went home. You can see how small the road damage was, it didn't even extend across half a carriageway or a quarter of the total road width on a straight section, wouldn't a barrier or temporary traffic lights have sufficed? The road stayed closed and villagers were forced to travel an extra 4 miles each way all week. The school bus was late, villagers were delayed and there were several near misses on the totally inadequate diversion route. The road surface has been badly damaged by the heavy lorries using the diversion by the way. So why did this happen when as you can see from above that the road damage was very slight - your webmaster has seen larger potholes! 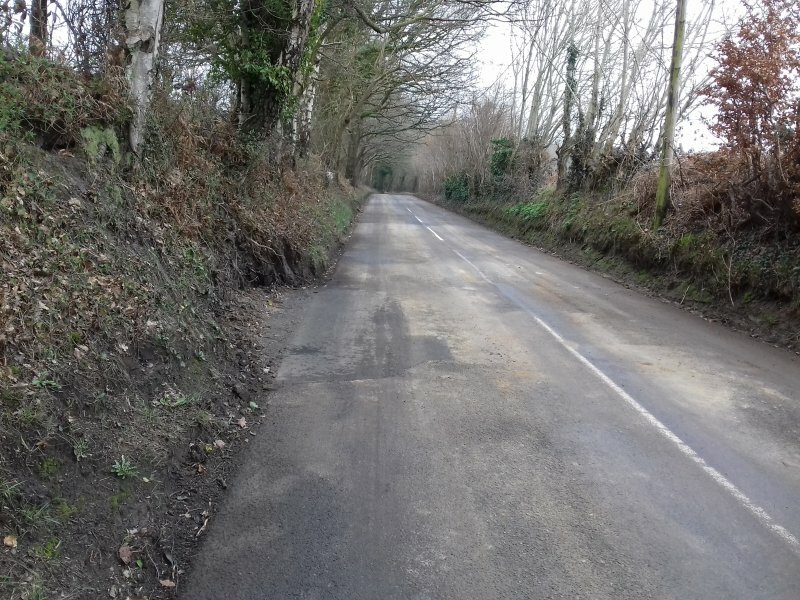 It seems that the road surface was reinstated late on Wednesday - quite why it took 3 days to put down a couple of bags of mastic is anyone's guess but then the job was again simply forgotten. South East Water had obtained a road closure order which expires on Friday so why should they rush? Your webmaster - and several of his neighbours - have been in contact with South East Water but they just seem uninterested assuming that somebody else was dealing with it! Yes the girls in the call centre are sympathetic but it's not them who are paying for an extra 8 miles fuel on every journey is it? That means that a person who is run to and picked up from the station will have travelled an extra 80 miles this week! What about the extra pollution, and the cost? We would naturally be happy to publish any justification that South East Water can produce here, in the mean time, as you can see from the tyre marks, some people are simply ignoring the Road Closed signs!. If you want to make a fuss? Try http://www.southeastwater.co.uk/contact-us in the first instance otherwise try The Consumer Council for Water https://www.ccwater.org.uk/adviceandcomplaints/ or OFWAT the water regulators http://www.ofwat.gov.uk/ . We seem to get more sales calls in this area than most others - probably because we are seen as "rich" around here! We used to get at least 3 or 4 dud calls a day but for the past week we have received just one! Why and how? 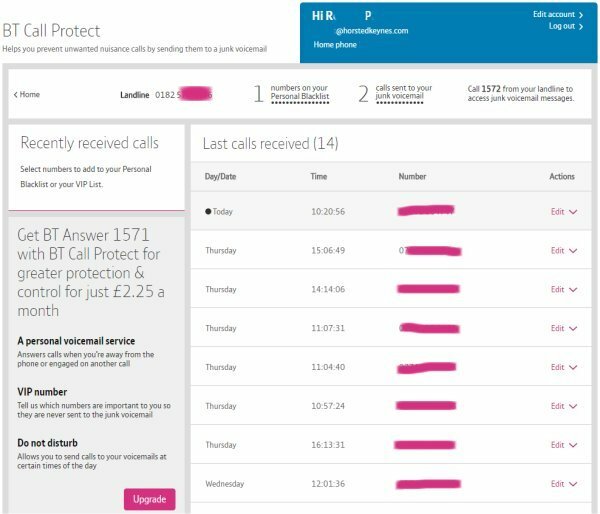 If you use BT as your phone supplier they now have a new service called "BT Call Protect" - it's free and it actually works! It seems that BT have at last come up with a scheme that does not deny them income (the real reason why they have been so reluctant to set up a working scheme before) but it stops your home phone from constantly ringing! The basic scheme if absolutely free so let me explain how this works. BT have for a long time known who the scammers are but as I said they did not want to stop their calls as it would deny BT income as they get money from every call that is put through - even from overseas VOIP calls. What happens now is calls that are definitely scam (those that dial thousands of numbers each hour) are diverted to your personal "Junk voice mail" folder. This records any calls that are scams and you can listen to them when you want (as if!). If a call does get through to your phone - we received our first today from a small company who claimed to not have heard of the TPS - then you dial 1572 and their number is automatically blocked. The system even followers scam callers around and still blocks them if they change their phone number - clever! This free scheme works for most people but if you want to pay about £2 a month there are extra features available (for example making certain numbers "white" so that they always get though and a "Do not disturb" system). We don't think this is really worth it - but that's up to you. So how do you subscribe to BT Call Protect? BT have not made it as simple as they might but what you need to do is log onto your account via the BT web site and add it as a new Call Feature there. You will need to know your account number to do this. We think BT should have made it very simple to join by just getting you to ring a certain number to enrol in the free scheme, this would make it easy for older people for example. All in all the scheme seems to be working well for now - time will tell if the scammers find a way round the new system and our phone starts ringing every time I get in the bath! Our personal report with some details redacted showing no less than 14 blocked calls in the past few days! 100F IN HORSTED KEYNES TODAY! The HorstedKeynes.Com weather station which automatically reports to the Met Office recorded a temperature of 37.78c which is just 100F at 18:30 this evening! We think the sudden increase may be due to people watering their gardens, as it was teetering at about 96F all afternoon. More soon. BEWARE CALLS FROM 0203817446 AND OTHER NUMBERS - A BRAND NEW AND NASTY PHONE SCAM - PLEASE WARN AGED PARENTS ETC! A new phone scam has just started in our area. You get a call or calls from the above number - actually it's from Asia and the number has been faked but we will pass over that for now. The first calls can be silent and can be repeated, it's just a way of annoying you. Exactly 30 seconds later you receive a call from a very helpful person - also from Asia but of course pretending to have a very English name. This second person just "happens" to ring you from "The National Do Not Call Register" or "The Telephone Call Organisation" or a similar made up organisation name and they say they are conducting a survey into nuisance calls. When they hear that you often receive annoying calls (of course you do it was them who made the calls in the first place!) they offer to stop all such future calls by sending you a device to fit to your telephone line at a "cost price" of about £100. This price is negotiable and they will go down if you are reluctant to bite. Eventually you receive a small box in the post from China. It is about the size of two matchboxes and has s single phone wire sticking out of it which you plug into a spare phone socket and hopefully forget. There are no instructions so that you have nothing to remind you that its there. After a few days just sitting there, and certainly not stopping any sales calls the box starts to automatically dial out to expensive premium rate numbers. You know nothing about this of course until you get your phone bill. Even then you may not realise that this box is responsible and may go down the phone company route of accusing everybody who has access to your home including your children. It can get quite nasty - the hackers don't care. Oh the premium rate numbers are also of course owned by the same scammer organisation - get the idea? We will point out here the threat of fitting any unknown device to your phone line as well as of giving someone from the other side of the world your bank or credit card details and would simply suggest that you AVOID answering calls from any unknown number as this is the call that seems to start the whole process. There are a growing number of messages on the internet about this new scam and we are still looking into it but do, please be careful because IF the device turns up - if you are lucky you may just receive an empty box with a wire on the end (which is the best scenario as all you will have lost is your original money) but far worse is the active device that makes hundreds of chargeable calls to expensive overseas premium rate numbers. Obviously as you plugged the box into your phone line these calls all came from your line and you are therefore totally responsible for them! Indeed if you don't pay your phone can be cut off! Many people think that you need a phone to initiate a phone call - you do NOT! We think that you will be hearing a LOT more of this nasty new scam in the future. Beware and NEVER fit any device to your phone line - or plug anything into your computer - if you don't understand exactly what it is for. We expect to have people making sobbing interviews on TV soon saying that they did not realise that they were responsible for the multi thousand pound phone bill that they have just received and expecting the phone companies (that's you and me) to pay for them. We do in this case have some slight sympathy as the police and other organisations do not seem interested but it should be obvious that it is a scam really. That is why we are urging people to tell their aged relatives who may be less technically savvy. UPDATE Sunday 21st June, We have just seen one of these boxes which had started dialling out (to who knows where?). It seems that the internal clock had been set wrongly as it was tying up the customers phone line during the daytime instead of what was probably intended to ring out at night. When they picked up their phone they kept hearing two girls talking in a foreign language which rather confirms our suspicions. Looking inside the box there were two micro chips with the identities rubbed off. We really need to get hold of one of these boxes so that it can be investigated by a competent authority as the memory will hold the numbers that it dials and that may be a clue to the organisation behind the scam. Please warn aged parents etc and NEVER attach anything to your phone line if you don't know exactly what it is all about! The householder had paid £120 for the box and still awaits their phone bill with some trepidation! 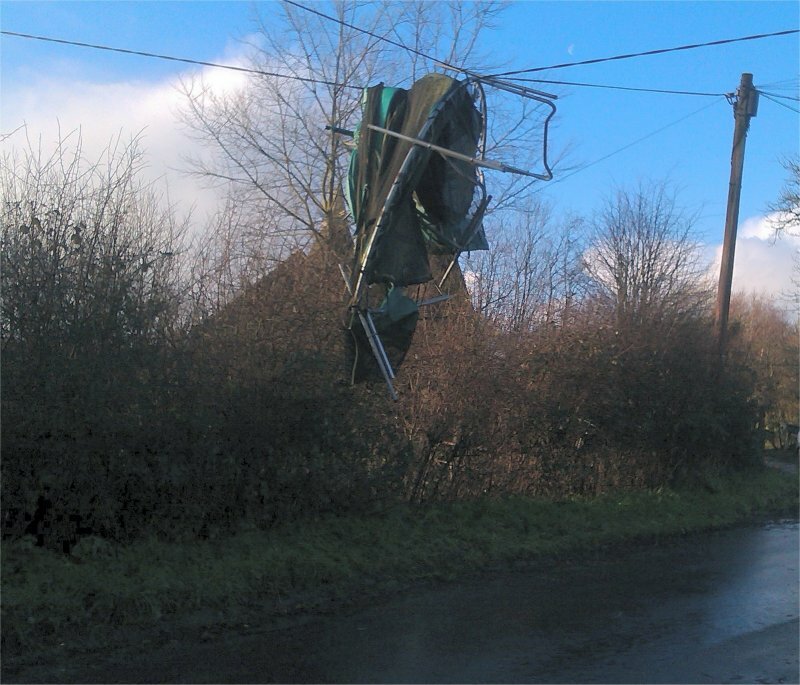 A garden trampoline blown onto power cables in Ketches Lane. A solitary engineer was roistered to deal with this incident, driving his own car and armed with just a screwdriver and some boltcutters! We are sorry that this news update has taken so long to arrive on the internet but like most other villagers we have been without mains power over the Christmas period. Many villagers without home generators were forced to throw their Christmas food away as the outages went on for more than 48 hours in some instances. One villager complained that the electricity kept coming and going which meant food that was partially cooked had to be thrown away too. We do want to make one comment. That is that very, very few villagers bothered to telephone UK Power Networks 0800 783 8866 to tell them that their power was off especially when it went off for a second time. Now the way that their repair work is prioritised is that outages covering the largest number of homes are dealt with first. Your webmasters were the only people in our road to bother to report when the power went off for a second time (caused by a completely different fault) which meant that in our corner of the village power was not restored until Christmas Day afternoon. Had others reported it we are told that we WOULD have been reconnected earlier. Please bear this in mind, next time! We have to add that one of the casualties of the power cut was the computer that had faithfully uploaded our web camera and weather forecast reports. This has had to be replaced together with the uninterruptible power supply unit. We will try to keep this new unit on line but only the weather, and UK Power Networks can tell for how long that will be! We have noticed that our lights have been dim since Christmas Day and first reported the fact to UK Power Networks late on Christmas afternoon. Since them we have telephoned several times to little effect. This afternoon, after we formally reported the fault again yesterday, the voltage suddenly dropped, to a little over 170 Volts, which instantly blew the power supply on our server computer, this despite it being connected through an uninterruptible power supply. Yet another server power supply is on order, in the mean time we are using an old laptop which can only be switched on for a half hour at a time. So since Christmas we have had to obtain a new computer server, a new uninterruptible power supply and just now order yet another computer power supply! It's all getting rather expensive and a little beyond a joke! Fully qualified, CRB checked, insured. After what can only be described as a mild winter so far we thought that we might have got away with it, but the village awoke to find itself shivering under a think blanket of show on Sunday 5th February. An overnight fall of 5 inches left side roads icy and difficult to drive. Pavements were of course extremely slipper. The Sunday papers didn't make it until later in the morning but a snow plough managed to clear the bus route later in the day. With winds coming straight from Siberia a hard freeze was forecast to return for the rest of the week with more snow expected. Now let's just take a look at the central heating oil level! COLDEST NIGHT OF THE YEAR - SO FAR! Temperatures sank to the lowest so fat this winter on the night of 10th February when the cold reached -11c. More cold weather is forecast. New Vodafone mast live in the area? As you will know we are not well served by mobile phones in this area. We have reports that Vodafone signals have dramatically increased in the area possibly from a new mast in Sharpthorne. If anyone has firm details we are sure that other villagers would be interested to hear. TV and video crews invade the village! By a quarter past five it was all over! A Bomb Disposal Squad have performed a controlled explosion in the field opposite Jefferies after finding a haul of ordinance in the home of a recently deceased security expert. Apparently a small quantity of Semtex was found amongst the haul which also included bullets and replica weapons. Police, fire, ambulance, Red Cross, the council emergency officer and just about every other emergency service took over a large part of the village, and blue tape went up to block local roads just after 2p.m. 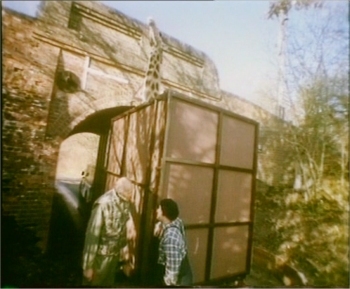 Villagers from a 200 metre radius were evacuated ("take your pets with you") and asked to go to the Village Hall until the bomb disposal team could attend. Apparently there was a problem finding the key to the Village Hall (we think that there may have been confusion between the Martindale and the Village Hall) so some residents instead settled down in the Green Man! Apparently a few older people were taken to the Claire Hall in Haywards Heath to protect them from the intense cold and snow. Just after 5p.m. a very loud bang and a cloud of earth and sand signalled the end to the emergency and villagers were able to return home in time for a late tea! Local residents, societies and similar may have an advert on the village web site without charge - if you make money out of it though we would hope to get something back to help towards our hosting costs. The amount is entirely up to you. Businesses may of course advertise here too but we would have to negotiate a payment of some sort up front. Nothing too onerous, but we do have to pay for our hosting costs! Lineage copy will be reproduced as received in our choice of format, subject to normal acceptance conditions for propriety, length, etc. We reserve the right to remove lineage adverts after a month or two, if you want them to remain longer please remember to get in touch. If you sell the item quickly we would greatly appreciate your letting us know so that we can keep our pages up to date. Display adverts should conform to the standard internet sizes. This is to make sure that adverts can be swapped about by our server without the pages going "askew". There is a good article here which gives the standard web sizes http://en.wikipedia.org/wiki/Banner_ads . We would be happy to design and advise on your advert upoon request and again subject to some sort of recompense. The site gets nearly 60,000 hits each month, about 45% new visitors and we are linked from many large web sites including several recommendations from the BBC.! Your advert will therefore be seen by many people, however a majority are from overseas, particularly Canada and the USA so your local event might need to be advertised elsewhere too! Finally, as we are at the very top of the first page on some Google searches you can be guaranteed that your web site (if the address is included in the advert) will be added to the Google database with a high rank. This can be the quickest way to get on Google and we are prepared to offer a short term front page link for this purpose. Charges on request and far less than professional internet promoters charge! PLEASE DO NOT STEAL OUR WORK! If this web site was a book that you had written and you found that a local book shop was selling off photocopies with a different authors name on the cover you would be a little miffed, wouldn't you? This web site contains more than 50Meg of material most of which is unavailable anywhere else in this form and which has taken us literally years of work to compile. The fact that it is published on a computer is immaterial. Lately we have found several cases of sites (mostly larger than ourselves) stealing our source material just to make their half empty pages look better. In one case more than 100k (that's probably 30 A4 size pages of text) have been found on another site - complete with our grammatical and spelling errors - now corrected. It just forgot to mention that we wrote the material! This is not only unfair it is illegal. 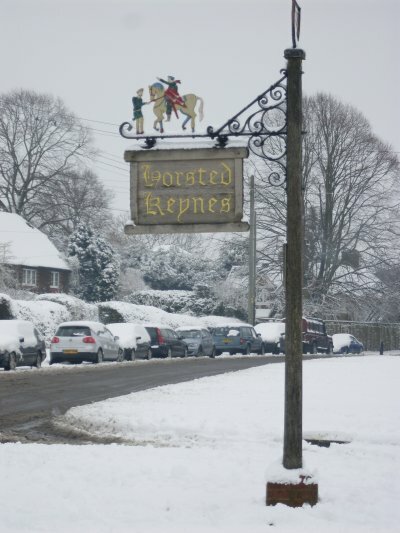 When we do a picture search for Horsted Keynes things are even worse; we see photographs from this site all over the internet! Let's make this 100% clear - if you find a photograph on the internet you cannot just right click it and then put it on your own web site. Photographs (up to a certain age anyway) are copyright and reproduction is illegal. Without exception if we have found a recent photo that we think might look good on these web pages we ASK FIRST. Usually people are honoured to help (as are we) but occasionally we get stonewalled. That's life! As our site gets bigger and the village gets better known, more visitors will come to us both electronically and in person, so we are determined to make HorstedKeynes.Com the best village site in the UK. To do this we have to publish content that is both exclusive and accurate. This won't happen if out of date, unchecked, material is available all over the internet. Here is our final warning. We now have a copyright lawyer who lives locally and has offered us free use of her services. Warning emails have been sent to the miscreants (sorry, copyright thieves) and if the theft continues we WILL sue and claim damages. You have been warned! The silly thing is as we say at the foot of every page. Other web sites are welcome to use our material free of charge, as long as they ask first and acknowledge us as the original authors of the material! In this way we can advise them of amendments and updates, it's not much to ask, is it? If YOU see our work (that's pictures or text) on other web sites please do let us know. As far as we are aware we have not lifted a single sentence from another web site without permission (except addresses and 'phone numbers which we copy and paste for accuracy), so if the text is the same or the pictures seem familiar, it's probably been "borrowed" from us! 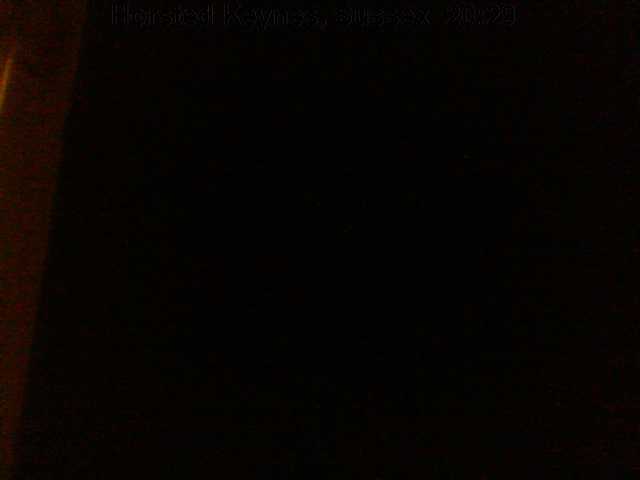 Please email copyright@horstedkeynes.com with the address where you saw the information. We will take a look and in most cases can confirm with 100% accuracy whether it's our work or not. You may remain anonymous or give us your name as you wish. We won't contact you back unless you say that we can, and your name would never be mentioned publicly in form. p.s. ANYONE may provide a link to this site without asking first. If you do link to us (and let us know) we will link back to you, this will boost both our ratings as we are at or near the top of many search engines! Recently retired gentleman who regularly drives to Europe - can I help you? As the above heading says I regularly have occasion to travel with my large estate car to France, Belgium, Holland, Germany etc. I have often thought that my spare "capacity" might be used to someone else's advantage and help cover my travelling expenses. I am also prepared to travel specially for an urgent job. Perhaps delivering or collecting where some "intelligence" is required or even using my experience as an electronics engineer where technical skill is required. How about obtaining a signature and returning urgently? Perhaps to meet your client or even just picking up some beer on the way back (subject of course to the current legislation!). There must be times when you wished that someone with a bit of intelligence could "go over there now" to act for you. I have a lot of experience driving in Europe and living locally in Mid-Sussex as well as being a Eurotunnel "regular traveller" means that in an emergency I can claim a ticket on the very next shuttle and therefore be driving on the European road network within a couple of hours of leaving Mid - Sussex. Naturally driving a private vehicle means that I am not subject to commercial vehicle driving restrictions. If you think there might be any way that we might be able to help each other do please drop an email to europe -at- horstedkeynes dot com. Written that way so that the address isn't used for spam, so you'll have to type the email address into your browser in the normal @ way. I look forward to hearing from you. No obligation either way.